Corvette "America's Sports Car" made its debut in Jan '53 as a Motorama Show car. It was a 30-month design and development effort by Harvey Earl. Production commenced June 30th on a small line in Flint, Michigan in Chevrolet's Customer Delivery Center. The first Corvettes were virtually hand-built at the plant. The new car took its name from the corvette, a small, maneuverable fighting frigate (the credit for the naming goes to Myron Scott). Styling was vintage Harvey Earl: rounded and rather bulbous with extended pod-type taillights, a toothy grille and trendy wraparound windshield - hardly timeless, though it looked great at the time. The outer body was made out of then-revolutionary fiberglass, selected in part because of steel quotas left over from the war. Underneath the new body material were standard Chevrolet components, including the "Blue Flame" inline six-cylinder truck engine, two-speed Powerglide automatic transmission, and drum brakes from Chevrolet's regular car line. Ironically, in view of what lay ahead, Corvette was almost cancelled after 1954 due to very low sales. Just 315 were built for 53, followed by 3640 for 54 and a mere 674 of the 55's. Poor sales figures were largely due to several poor design and performance features including the plodding drivetrain with the "stovebolt" six engine and automatic 2 speed Powerglide, plastic removable sidecurtains, lack of exterior door handles and clumsy looking cloth top. 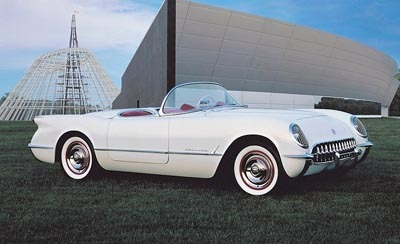 Thanks to pleas from Earl and Chevy chief Engineer Ed Cole, GM decided in late 1954 to give Corvette a second chance. Cole would provide Corvette with the new 265 CID overhead valve V-8 he had designed for the 1955 Chevy passenger cars. Installed at 195 HP it vastly improved Corvette's performance - and a second influence was a Soviet emigrant in GM's engineering department, Zora Arkus-Duntov. Arkus-Duntov simply took the new V8 and backed it with a three-speed manual transmission. That modification, probably the single most important in the car's history, it helped turn the Corvette from a two-seat curiosity into a genuine performer. Only a few 1955's were equipped with an optional 3 speed manual gearbox. Another key factor in the Corvette's survival was Ford's introduction, in 1955, of the two-seat Thunderbird, which was billed as a "personal luxury car", not a sports car. Even so, the Ford-Chevrolet rivalry in those days demanded that GM not appear to back down from the challenge. Corvette's second-generation car for 1956 is the model that established worldwide recognition for high performance and beautiful styling. It offered a 225 HP dual 4 BBL engine with 0-60 time of only 7.5 seconds and could pull 120 MPH. Newly designed front and rear ends with beautifully sculpted bodysides with curving-concave coves were an improvement over the stubby slab-sided original. Roll-up windows, optional hardtop and outside door handles were the icing on the cake to make the '56 a tremendous success. No need to change the styling for '57 but Chevy upped performance by boring the V-8 to 283 CID and offering a fuel injected option upping the HP to an amazing 283 with an optional 4 speed transmission. The "fuelie" road tests showed a 0-60 time of 5.7 second and a top speed of 132 MPH. Corvette now began making its mark in International racing. After finishing 1st and 2nd in the GT class at Sebring, it was included as one of the world's best sports cars. Buyers happily bought 3467 ofthe '56's and 6339 ofthe '57's. Corvettes future was assured. The '58, '59 and '60 Corvettes brought a longer and wider design with dual headlights. In 1960 over 10,000 units were sold, and an optional 315 HP was available that boasted 0-60 in 5.5 seconds. 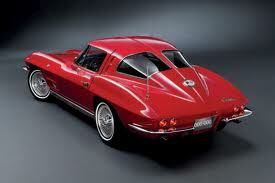 Corvette for '61 and '62 offered newly designed rear end and a 327 CID engine that developed 360 HP. Sports car enthusiasts continued to love the car and sales climbed to over 14,500. And now came the 1963 all-new Stingray, the first complete redesign of the car in 7 years. The second generation, or mid-year, was designed by Larry Shinoda with major inspiration from a previous unproduced design called the "Q Corvette" by Peter Brock and Chuck Pohlmann, and under the styling direction of Bill Mitchell. It was a beautiful sculptured design with hidden headlights and offered independent rear suspension, a first for an American production car. The '63 had more steel reinforcing around the cockpit and a better brake system for safety. This Corvette was offered in either a roadster or fast back coupe, and these models remained unchanged through 1967. Horsepower also steadily increased. In 1964 the 327 was boosted to as high as 375 PHP but in 1965 the "big block" 396 made its debut. It was enlarged to 427 CID and in 1966 it was clocked at less than 5 sec. 0-60 and could top 140 MPH. In 1967 Corvette offered an L-88 option with aluminum heads and 12.5:1 compression that was rated at 560 BHP. Only 20 were produced but they symbolized how far the Vette had come. The year 1968 brought a completely new Corvette design also known as the Stingray but was not well liked by a lot of enthusiasts. It also had a lot of factory "kinks" like poor workrnanship and cooling problems on big block cars. Yet, in spite of all this the '68 set another record of 28,500 units. 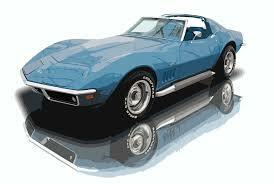 In 1969 Corvette sold an amazing 38,800 cars and car number 250,000 came off the St. Louis assembly line. The 454 CID was an option on 1970 - 1974, but was dropped in 1975 due to emissions and gas price pressures in favor of a 205 HP 350 V-8. 1975 saw the last year for the convertible, which did not return until 1986. 1976 was the last year in which the name "Stingray" was used. 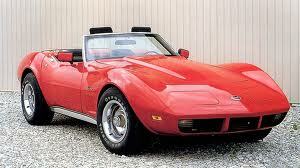 By 1975 the Corvette had become more balanced, less outlandish and more pleasant to drive. A juvenile straight-line screamer had matured into a suave "Gran Turismo". Copyright © 2015 by World Wide Web Foundry, LLC.